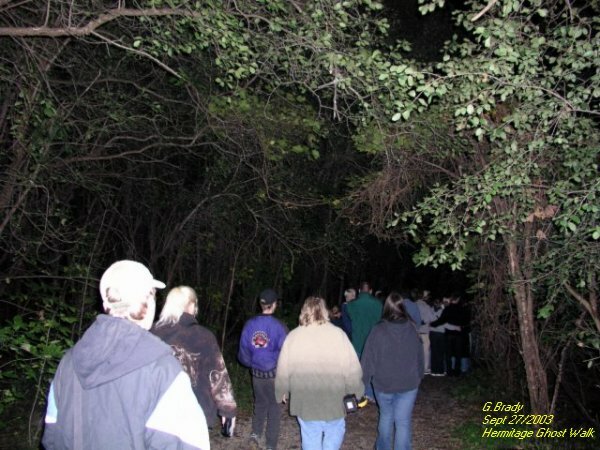 On Saturday Sept 27th/2003 we had a VIP invitation from Dan and Steph of Haunted Hamilton to attend the Hermitage Ghost Walk. We were pleased to attend this event although we were surprised to get an invite (free of charge) from a group that hates us. Putting this to the side we had planned to just enjoy the evening. When we first arrived it must have brought some strange looks as we pulled in with our hearse. The one security guard we had seen before was there and we chatted with him for awhile. 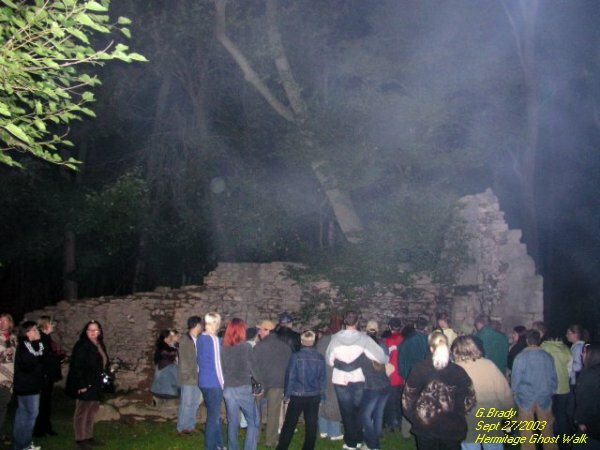 We went over and saw Dan and Steph and shook their hand, thanking them for the opportunity to attend the ghost walk. Both Dan and Steph were very polite and it was nice that we could put our political views to the side to enjoy the evening together as a group. Before the walk started I saw two folks that were just standing by their car watching other folks arriving for the walk. No one had gone over to them and they looked like they were newcomers to the walk. So I went over to these folks and introduced myself and welcomed them to the walk. To my surprise I shortly found out that they were Stephanie's parents.We chatted and they appeared to be very nice folks to talk to. Standing near the laundry room ruins during the tour, it was explained to the group that the coachman had hung himself on a tree by the stables. And that the branch of the tree that was pointed out always had a wet mark where the rope would have been. 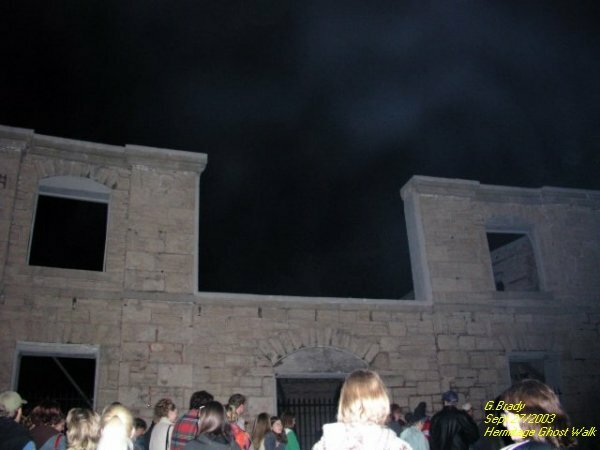 (The area we were standing in is what was referred to as the stables by the tour guides.) Dan and Steph did not do the tour themselves. They hired actors to conduct the tour. And from the scripts they were given to conduct the tour, they did a great job. The tour itself was very entertaining to say the least. We thought the actors did a splendid job and once again we thank Dan and Steph for inviting us out to this event. Below are some of the pictures we had taken on the tour. 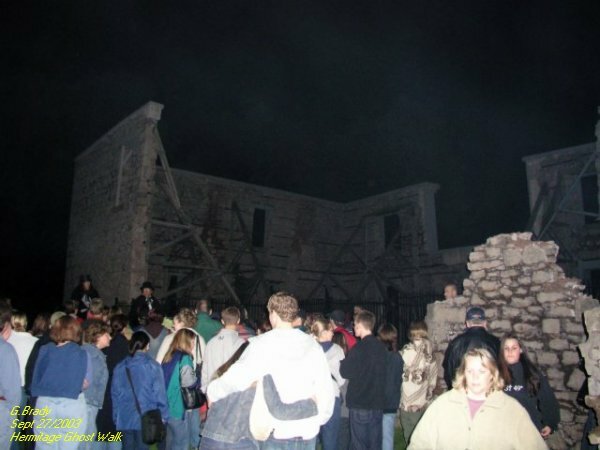 In the above photo you can see the group heading for the back of the gate house where eerie tales would unfold of the historical significance of Ancaster. 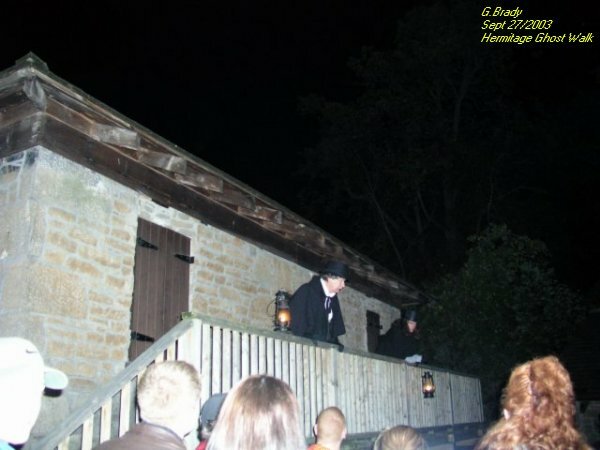 In this photo you can see George (one of the actors) relating the story of Ancaster. The other fellow that was down just from George was James. (Another actor that took part in the ghost walk.) Both did a great presentation all through the night. After the presentation we all headed for the main trail leading back through the woods that would lead us to the Hermitage ruins. As we proceeded through the forest I remained at the back of the group to take pictures. 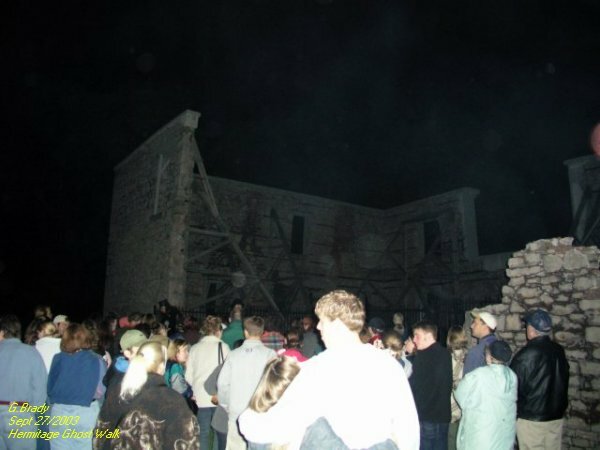 This was just a group shot of some of the people that attended the tour standing in front of the Hermitage ruins. This is the group standing near the laundry room. What seems to be ecto mist is in fact someone's cigarette smoke. 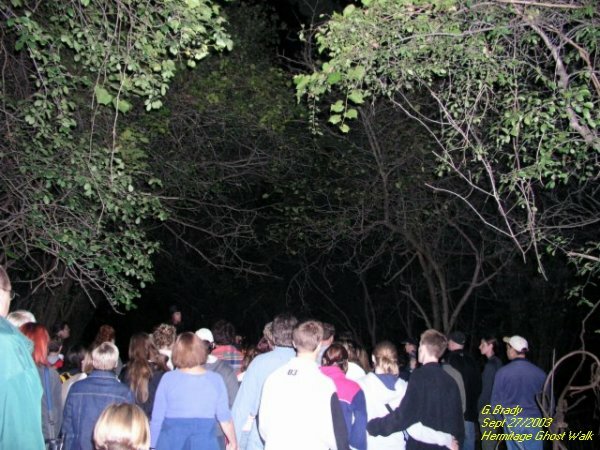 This is where the group was listening to the tour guides' haunted tales. Some even ventured up to share their own stories. 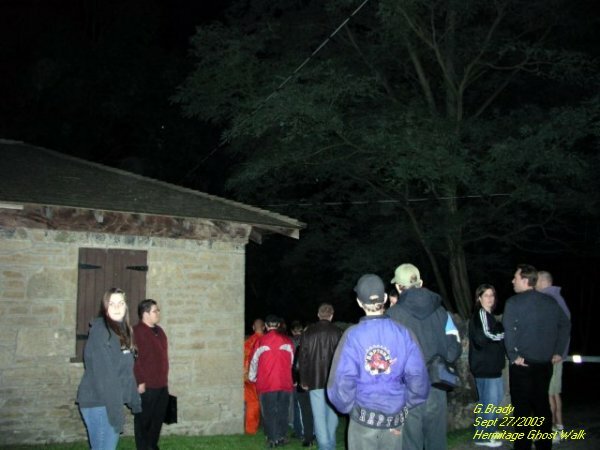 In this photo you can see George and James (tour guides) relating their stories of the paranormal.